Peterborough United manager Steve Evans was naturally thrilled as his side preserved their 100 per cent record with a stunning 5-1 League One victory at Plymouth today (August 25). Posh are now the only Football League club with a perfect record after Portsmouth drew at Doncaster. 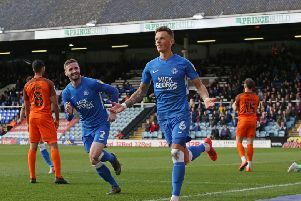 That result also enabled Posh to go two points clear at the top after completing five wins in the first five matches of a Football League season for the first time in the club’s history. Top scorer Jason Cummings and fellow striker Matt Godden scored twice with Siriki Dembele also on target. “I’m a very happy man,” Evans enthused. “To be top of the league, to have set a new club record and to play so well against a very good team makes me very proud. “I am in awe of the people who have managed this club in the past. The likes of Chris Turner, Noel Cantwell and Darren Ferguson are heroes of mine for what they did at this club as managers and if I can achieve the success they did I will be a very proud man. “Managing this club is a cause for me, not just a job and I am delighted with the results we have achieved so far and with the performances we have delivered. “This is only three points of course, but we can enjoy the moment. We were excellent from start to finish. We scored two early goals when we were dominant and then we dug in and defended well as a team when they had their best spell just before the break. “Keeping a clean sheet to half time was vital and then when we scored early in the second half as well it became a question of how many we would score. I’d have taken a 1-0 win here, but the quality of our attacking play was worthy of a big win. “Jason Cummings was excellent. He was a big signing for us. He’s not just a talented striker though he has bought in to the work ethic we demand. Posh are next in action against Grant McCann’s Doncaster at the ABAX Stadium next Saturday (September 1). Posh fans can meet the players and managament at the club’s open day at the ABAX tomorrow (August 26). Doors open at the stadium at 11am.